If you finally decided to take the plunge and get a high-end winter jacket, then it’s time to decide which brand to go for. But how do you decide which brand to give a shot, when most of them are so similar? In this review, we’ll check out jackets from Canada Goose and Moncler - two established outerwear brands. There’s an obvious difference between them from the start – Canada Goose is better suited for the sporty person, while Moncler is the obvious choice for those who often dress up. I’ll show you some of the best-selling jackets from both brands, and hopefully that will help you find exactly what you’re looking for! Moncler and Canada Goose jackets aren’t impulse purchases. They are investments – you are spending a lot of money because you know the level of quality you are going to get. You are basically getting one pricey jacket so that you don’t have to buy a new one every winter. That investment should last you for years, right? That’s completely possible with Canada Goose. Their jackets are designed to be worn on a daily basis, and to protect you even in the harshest of colds. Plus, they offer lifetime warranty on their products – if your jacket gets damaged due to a manufacturing defect, Canada Goose will either fix it, or send you replacement. Their warrant does not cover accidents, negligence or normal wear and tear. But say the zipper on your jacket breaks or stops working for no reason – they will fix that. Also, the warranty is only valid is you don’t remove the garment tags inside the jacket, so keep that in mind. That’s a lot better than what Moncler has to offer. They don’t give you any kind of warranty, and in fact they even openly tell you that their jackets should not be worn in extreme conditions. So really, this is a question of functionality – do you want a jacket that you can wear on a daily basis, or one that’s more reserved for special occasions? Generally, Moncler is a luxury designer brand. So naturally, their jackets are more expensive. You’re not paying so much for the materials, as you are for the branding – just like with Gucci or Dolce. Whether or not that makes their prices justified is a matter of personal opinion. Some of you will find that to be ridiculous, while others will probably be willing to pay more just for the exclusivity of the brand. Canada Goose is generally the cheaper brand out of the two. If you prioritize functionality over style and want to pay as little as possible, then Canada Goose is definitely the better option for you. You’ll still be paying a lot, but you will definitely be getting your money’s worth. Especially considering the previous point I told you about – their warranty system and long term durability. However, I will mostly show you jackets from both brands that are similarly priced. I'll avoid anything too extravagant, since that's out of the price range for most people! Moncler, being the designer brand, obviously offers jackets that are more stylish. They are generally slimmer, especially the women’s options. They are more form-fitting, which helps you feel better when you are wearing the jacket. 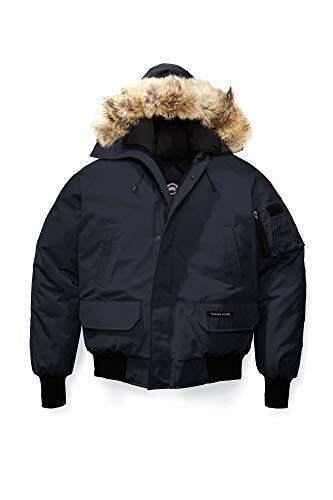 And frankly, they look so much better than Canada Goose jackets – judging simply by the overall appearance of the jackets, Moncler is definitely the obvious winner. Canada Goose doesn’t pay too much attention to style. Instead, they focus more on function. Don’t get me wrong – some of their jackets are still pretty stylish, but when you put them side by side to a Moncler one, they do fall short. 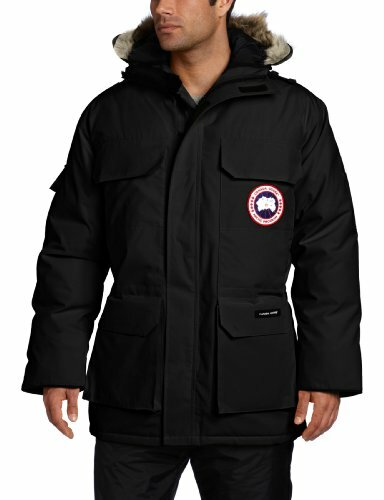 However, Canada Goose jackets are also the warmer choice. And that is the more important feature, if you ask me. I’m completely okay with not looking like a movie star, if I’m going to be warm in -20 degrees Celsius. But the choice is ultimately yours – can you bear being a little cold if you are going to look super trendy? Or are you so afraid of the cold that you don’t care about style at all, and just want to be as warm as possible? Obviously, you should look for a jacket that matches the level of warmth you are looking for. And the TEI rating can be really helpful with that. Keep in mind that we’ll mostly focus on jackets with a rating of 3 and up in this review. This is one of a few Canada Goose jackets that’s available for both and women. And it’s one of the warmest products they have to offer. It was originally designed for scientists working in Antarctica, so you can imagine just how warm this jacket is. It actually has a TEI rating 5, so it’s basically suitable only for those who live in extremely cold areas. It’s a relaxed fit jacket, so you can easily wear thick sweaters and hoodies underneath it. The elastic cuffs keep the draft out of the sleeves, and the Velcro storm placket keeps it out of the body. Those features make the Expedition Parka extremely good at retaining body warmth and just keeping you warm in general. It also has a fleece lined chin guard, for enhanced comfort and warmth. The hood has a removable fur ruff, and also a shaping wire that helps it stay on your head even in really harsh winds. Additionally, it is also insulated with down, just like the rest of the jacket. There are six external pockets on the parka – two of those are utility pockets on the sleeves. The other four are all double entry pockets, with a Velcro top flap and zippered sides. Overall, this is definitely an extreme jacket. But if that’s exactly what you are looking for, then the Expedition Parka is the perfect choice for you. This is a slim fit jacket for the ladies. It’s insulated with 625 fill power duck down and it has a TEI rating of 3 – meaning that it’s perfectly good for everyday wear. It is a pretty long jacket, so you might not have the best range of motion when you are wearing it. But the zipper on it is two way, and you can always unzip the bottom half should you need a wider range. The Kensington parka features shoulder straps on the lining, which allow you to wear this jacket like a backpack. I think that’s pretty cool and actually really useful – for one thing, you don’t have to carry it in your arms when you get warm enough. And also, wearing the parka like a backpack instead of draping it helps keep your back warm, while allowing the rest of your body to cool down a bit. 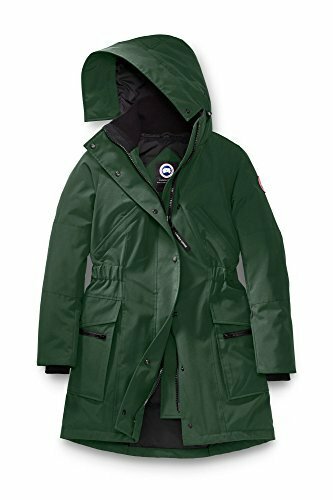 This Canada Goose parka features one internal drop pocket and four external pockets that are all fleece lined and have snap closure. Additionally, you can cinch in the waist of this jacket a bit, which allows you to get a really good fit. One that is much more flattering for a women’s silhouette. It is both wind and water resistant, and it’s actually a really versatile jacket. You can wear it to work or up in the snowy mountains, and it will still keep you toasty. Definitely consider getting the Kensington if you’re looking for a long parka. Don’t let the name fool you – this is anything but a traditional bomber (warmth-wise). Canada Goose only called it that because of the length of the jacket. Actually, the Chilliwack has a TEI 3 rating, meaning that it’s going to keep you warm even in temperatures as low as -20°C. Plus it’s a shorter down jacket, so it’s a great for choice for all of you who aren’t big fans of coats and parkas. The bomber length of this jacket gives you excellent mobility whatever you’re doing. But it also means that your thighs and behind won’t be as warm as your torso – that’s one area where parkas do a better job than short jackets. The Chilliwack is insulated with 625 fill power down throughout, including the hood. It is also both wind and water resistant – the elastic cuffs and storm placket with military buttons help with the latter. Plus, the hood has a shaping wire that really help it stand up to some strong winds. 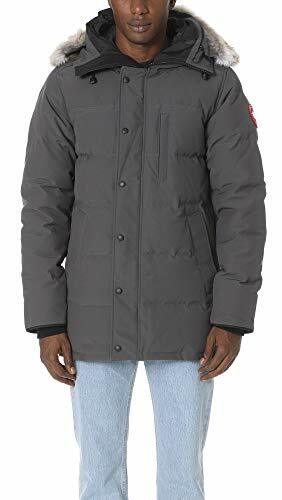 This Canada Goose jacket features a single interior drop-in pocket, and five external ones. Those include two lower hand warming pocket, two chest pockets and a single pocket on the right sleeve. Overall, it’s a great choice for daily wear, since it is both versatile and functional, but also pretty stylish. 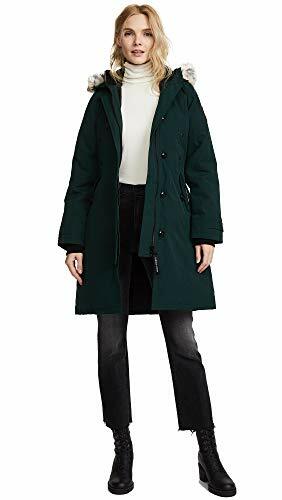 The Kinley parka is kind of like an upgraded Kensington parka- Kinley’s design draws a lot of features from it. It also has a TEI 3 rating, but there are some obvious differences between the two, like the cinched in waist and the snorkel hood. Even though this is a pretty long parka, it still offers good range of motion. One reason for that is the back vent with snap closure, which allows you to quickly adjust how tight you want the jacket to be around your thighs. This is pretty useful considering that this is a slim fit jacket, and they generally provide you with less mobility. One thing I really love about this parka is that it doesn’t have any fur on it. And if you are also not a fan of natural fur, then this is the best Canada Goose jacket you can get! The hood of the parka is adjustable, and it is insulated with 625 fill power down, just like the rest of the jacket. The Kinley also has shoulder straps that allow you to carry it like a backpack, and I find that pretty useful. Additionally, it has a single internal pocket with zipper closure and four external ones. Two are fleece lined hand warming pockets, and the other two are drop in pockets with snap closure. The Carson parka is a great choice for men who are looking for a longer jacket, but that’s still not too long. This is hip length, so you still have pretty good mobility when you are wearing it, but it also keeps you warmer than a shorter jacket, since it covers a portion of your thighs and behind. It’s a slim fit jacket, so it might not be the best to wear over thick sweaters and hoodies. Go a size up if you want that option. It is a wind and water resistant parka, and it has a TEI rating of 4, meaning that it’s suitable for daily wear in really cold areas – between – 15°C and – 25°C. The elastic cuffs and the snap storm placket do a great job at retaining body heat and keeping the draft out. The tricot lined chin guard also helps with that, plus it just helps make you more comfortable in this jacket. It is entirely insulated with 625 fill power duck down, including the sleeves and the hood. But there are some cold spots around the arms and shoulders, so keep that in mind. There are three exterior pockets on the Carson parka – a chest pocket and two lower hand warming pockets, which are lined with fleece. There is also one internal pocket with zip closure, which is great for your valuable items, like your smartphone and wallet. The Torcol is one of the best-looking jackets in this entire review. At least for me. It has a matte duodone Nylon exterior, which is water resistant and pretty sturdy. This is a rare Moncler jacket that isn’t shiny, and I actually really like that. It’s medium length, so your mobility is limited. But it does feature a two-way zipper, which allows you to adjust your range of motion. The ratio of down-feather in this jacket is 90-10, which is more than enough to keep you warm. And it is insulated throughout, with velvet lining on the collar. That will keep your neck warm and seal in your body warmth, as long as you fully zip up the jacket. The collar does go pretty high, so it might not be the most comfortable to wear. But you’ll get used to it. This Moncler jacket does not have a hood. I don’t think that’s a big deal, but we’ll call it a downside – it does nothing in terms of keeping your head warm, and you still need a hat in winter. But it does have elastic cuffs that keep the draft out completely. This is a dry-clean only jacket. There is some silk in its composition, so it’s particularly important you don’t try washing it at home. Also, there are only two pockets on the Torcol, and both are external. Generally, this is a great jacket for when you want to dress up, but not really the best choice for the mountains. Daniel is a short men’s jacket. It offers great mobility because of its length, but not really too much warmth, since it cuts off at your hips. It is however insulated with down, with a 90-10 down-to feather ratio, so your torso should be quite warm. And the high collar should also feel cozy around your neck. 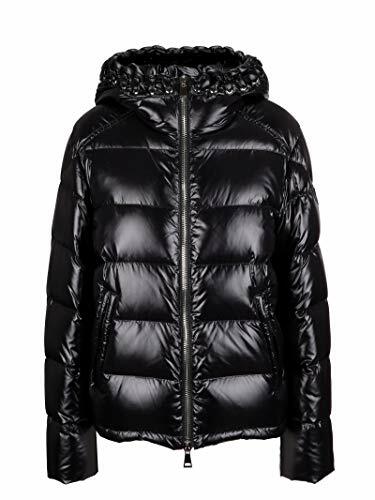 One thing to note about this Moncler jacket is that it runs small, so you will definitely need to go a size up. Luckily, there is a lot of size variety with this one and you can get in a larger size even if you regularly wear XXL. Which isn’t something I can say about all the other Moncler jackets. It’s a really thin and lightweight jacket, which makes it convenient for travel. But it’s also really light on the features – the Daniel jacket doesn’t have a hood, and it only has two pockets. Then again, it’s mostly a dress-up jacket, like other Monclers. It does have an interesting two-way zipper – it has a tricolor design, which is inspired by the French flag. The cuffs are adjustable, which allows for a more customized fit. But they don’t have inner elastic cuffs, so this jacket isn’t really wind resistant. It is water-resistant though, since the shell is made from Nylon. This jacket has a really interesting design. I’m not usually a fan of shiny black jackets, since I don’t really understand that whole trash-bag look. But, this one has woven details on the hood, back and sleeves, which actually look really cool. This jacket is made from Polyamide – a synthetic material composed of several layers of Nylon. It is water resistant but not really wind resistant. The jacket also has several leather accents, so it is a bit harder to maintain. Dry cleaning is advised, although you can also hand-wash it if you want. It’s hip-length, so you will have great mobility when you are wearing it. It’s a great jacket for everyday wear, since it is insulated with down and it will keep you sufficiently warm. Especially since it’s pretty thick. The hood also covers your entire neck and even chin, which is awesome for temperatures below zero. Plus it is insulated, just like the body of the jacket. There are two zippered hand warming pockets on the Almandine, which are spacious enough to fit your phone and some smaller necessities. Overall, this is a good casual jacket – it’s not really for dressing up, but rather for rocking street style. This Moncler jacket features a wool exterior. Wool is generally a really warm material, so this is probably one of the warmer Monclers you will find. But, unlike other materials, wool can still keep you warm even when it gets wet. It’s more breathable, and dries of really quickly. It features a removable hood, and the jackets looks pretty god with or without it. It’s a short jacket, so you will have good mobility in it. And in case you don’t, you can always use the two-way zipper to undo the lower part a bit. The Montgenevre is fully insulated with down, so there’s really no doubts about it being warm. It’s actually a pretty versatile jacket – due to its understated design, you can wear it both when you’re going to work and when you want to dress up a little. I guess the only place where you wouldn’t want to wear it is the mountain, since you don’t really want to expose it to extreme conditions. It features two zippered hand warming pockets, as well as a utility pocket on the left sleeve. Plus, this jacket also has an internal pocket, and it’s definitely the winner in that aspect – there is plenty of space for all your necessities. Overall it’s one of my top choices from this brand – it’s warm, comfortable and fits into anyone’s closet. The Linotte jacket is another popular choice. It’s made from Polyamide/Nylon, so it is pretty water resistant. It has a matte finish, which makes it look really elegant, and makes it a good choice for dressing up and special occasions. The mink fur collar also adds a dash of elegance to it, and helps keep you warm around the neck. It is insulated with down, so it is warm enough. It’s a medium-length jacket and it will cover the better part of your thighs. Pair this with some over the knee boots, and you will feel like you are walking around in a bubble of warmth. It has a two-way zipper, which helps you adjust your range of motion in this jacket. That’s pretty useful, especially considering the length. The cuffs are not adjustable or elastic, so they won’t keep the draft out completely. That’s one downside. 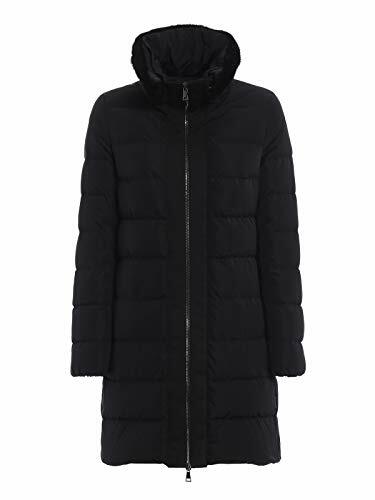 This Moncler coat features two external pockets, with hidden zippers. I love this actually – it makes the coat look more sophisticated overall, but still gives it some functionality. Overall, this is the perfect coat for anyone who needs something classy and elegant, but that will still keep them warm in the cold winter evenings. It’s very hard to say that one brand is better than the other, simply because their design aesthetics are so different. Moncler makes elegant jackets, ones that aren’t really meant to be worn in extreme conditions, but rather on special occasions. Canada Goose, on the other hand, is the better choice for sporty people. Their products are more suitable for nasty weather, and are overall warmer. And CG’s best jacket for men is the Chilliwack Bomber. It’s the perfect everyday jacket, since it has a casual but very modern design. Plus, it is exceptionally warm – with a TEI 3 rating, this Canada Goose jacket will be warm even when it gets well below zero. It has a bunch of different pockets, as well as an insulated hood, so it’s also pretty versatile. I think the Kinley parka is the top choice for the ladies. It has a flattering shape, but it is also adjustable at the waist, allowing for a more customized fit. The Kinley is an incredibly warm jacket with a TEI 3 rating, due to heavy down insulation. Plus it’s windproof and waterproof, and you can wear this pretty much anywhere – when you’re out and about, or when you’re taking on the mountains. The Montgenevre is definitely my pick for the gentlemen, and mostly because it has a wool exterior. That’s going to keep you warm even if you get the jacket wet, since it is a breathable material that dries off fairly quickly. Also, it’s a generally warm jacket, with plenty of pockets for your necessities. It has a classic design, so it’s good both for the everyday, as well as the occasional fancy dinner. 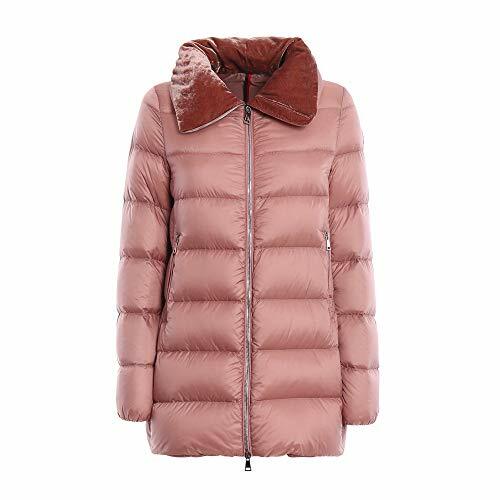 The Linotte coat is a must-have Moncler item for women. It’s such a versatile coat – you can wear it to work, to a restaurant, and even on the red carpet! That’s because of its elegant design and the color that goes with basically anything. It’s also a pretty warm and water resistant jacket, so not only will you look stunning, but you will also be really warm! You can check out the prices of all of these jackets on Amazon, so head over there if you saw something you liked. And if you haven't, maybe one of our posts below can help you finally find the perfect winter jacket for you!